Hi everyone! Today, for the second of my series of 3 piCture pOlish mini nail art challenge, I’ll be featuring O’Hara, Metallic Mush, and Bombshell. Remembrance Day (November 11th, next Monday) is the main theme behind my design. It’s a memorial day observed in Commonwealth countries since the end of World War I to commemorate the members of their armed forces who sacrificed their lives and heroically died in the line of duty in exchange for our freedom today. 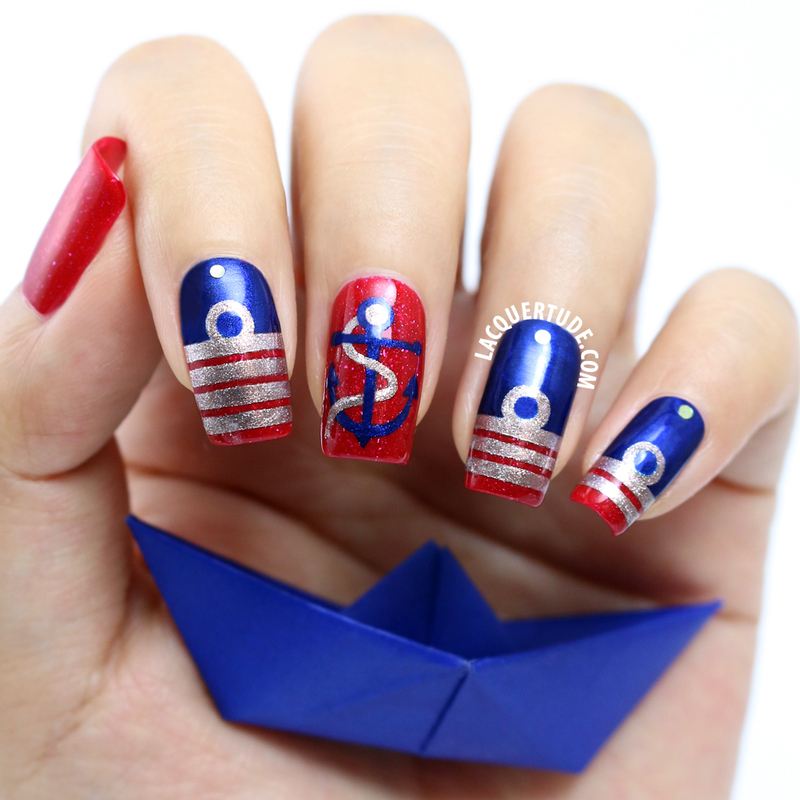 Since piCture pOlish is an Australian brand, I decided to use these three perfect colors for my Australian navy insignia inspired skittle nails, combining the vivid classic red, the twinkling metallic gold, and the bold metallic blue. Now, let’s take a look at my swatches of the gorgeous lacquers! Metallic Mush was a surprising hit for me. It has a pale champagne base striking the perfect balance between shades of silver and gold, making it easily wearable for most, if not all, skin tones. But, this is much more than an average metallic shade: it’s filled with fine shimmers that sparkle silver, champagne, gold, and bronze—mesmerizing me in every lighting situation. This lacquer, like all other piCture pOlishes I own, had absolutely stellar formula, allowing for ease of application, control. It was opaque for me in 1 coat, and I added a second for more depth and a brush stroke free finish. In spite of the shimmers, the polish finished with a smooth and shinny surface, not needing a topcoat. I had it on for 3 days straight and had no tip wear or chips. I can imagine myself with a classy evening gown and wearing Metallic Mush to add sparkle to the outfit. Here’s also a color sample to show off the texture of this beauty. 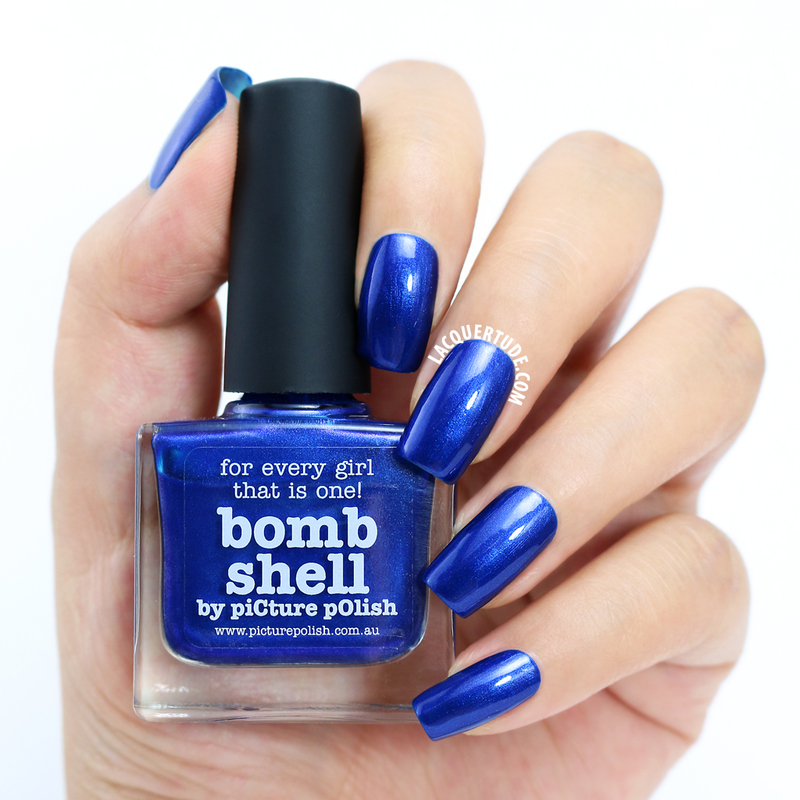 Bombshell is a bold and chic metallic blue that I can imagine going down the runway at the New York Fashion Show. It really is that stunning and high fashion. If you notice, like Metallic Mush, this lacquer is not your average metallic finish either. There are tiny shimmers running through it that helps achieve a smooth and brush stroke free finish on the nail. There’s also a hint of indigo purple in certain lighting (most visible around the edge of the bottle here). On the nail, that extra touch adds darkened edges, creating a lit within jewel toned feel while still remaining blue in all lighting. Formula is again perfect as usual and opaque in 2 coats. I included this color sample to show you the fine shimmers and the way the metallic blue reacts to the light. Please note that the brush strokes are due to painting on the paper. You can see that my nails are nice and smooth. 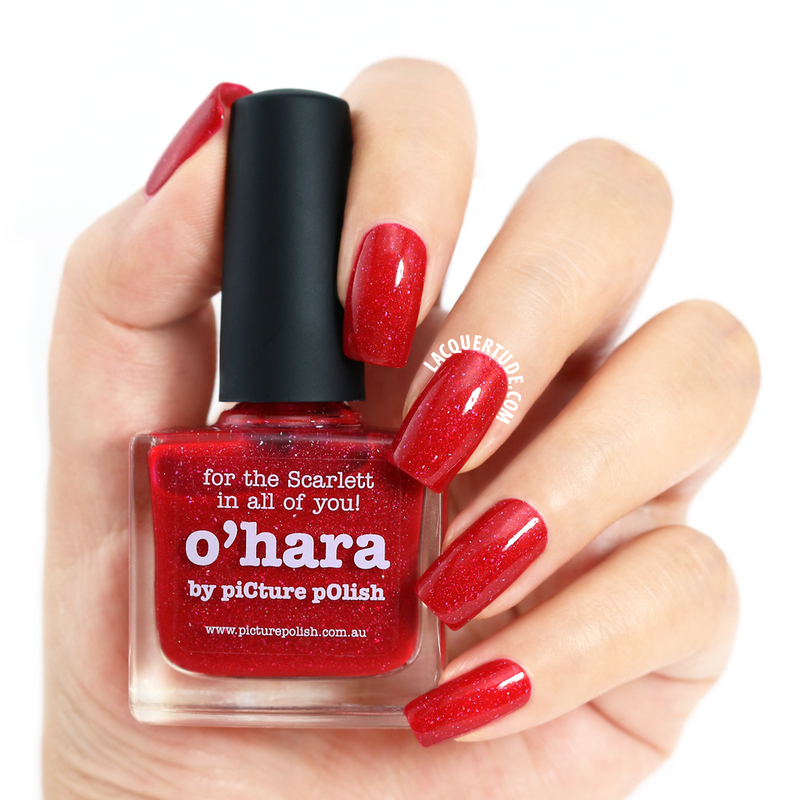 O’Hara is the bespoke red from the opulence line. The base is classic and powerful, reminding me of the character Scarlett from the movie Gone With The Wind who inspired this shade. It has a crelly formula that allows the signature piCture pOlish scattered holographic particles to shine through. For that extra special touch, there’s also added holographic shimmer. If you liked Cosmos or Ocean from my previous swatches here, you’ll need to add this gorgeous red to your collection! It would be perfect for Christmas, Valentines, and any day that you want to stand out from the crowd. 2 coats. So, what do you think about these 3 lacquers? Have I tempted you? Might I add again that all of them are perfect colors for Christmas too!